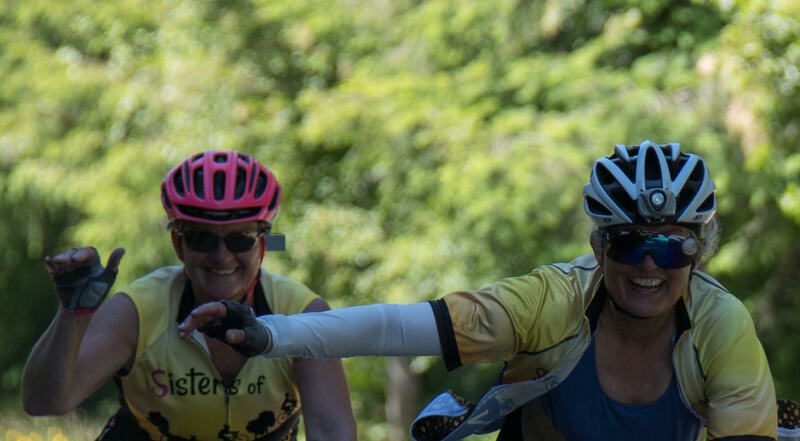 “Marshia...there are these Randonneurs who are riding from Fort St. John to Tsawwassen (1,300km in one week – what?!). The last leg is ‘only’ 200km; from Duncan to Victoria. I was thinking I might ride that....”never really fully committing to it mentally, or even imagining that M would be keen. There we were standing in the cool morning air in late June with the Gods of the Rando World at the start of the Peace to Parliament 200 km. Surely we would be able to ride with some of them....wouldn’t they be tired? No chance! It was great to chat with them on the shady roads as we spun out of Duncan onto Cowichan Lake Road. Then they vanished out of sight over the hills. There was minimal traffic, and absolutely great riding. What was to come had caused me some sleepless nights. There was a total of 2,229m of climbing. The route was 210km: Duncan, Lake Cowichan, Port Renfrew, Sooke, Victoria. Also it was likely that many drivers would be driving stoned at the weekend Port Renfrew Tall Tree Music Festival. Environment Canada forecast a heat wave that day – the hottest day of the year on Vancouver Island! What could possibly go wrong? But, thus far, it was good. The climb up to the summit from Lake Cowichan on the Pacific Marine Road was fine. John met us at the top for water and encouragement. We had a sweet descent into PR and were met by a cheerful crew with home-made goodies and ice! It was getting hot out there, but nothing unmanageable...yet. So, M and I left PR and knew (from a staged ride a couple of years ago) that we were going to have a Battle Royale on some hills. When we spied the first incline, both of us dropped the f-bomb. We continued in this mode on every new hill, until we had virtually used up our entire repertoire of expletives! OMG hilly, hot, and...what could be more challenging?...a lone bear cub galloping across the road! We came to a screeching halt, while we gathered our courage and our diminishing wits. We decided that we were going to have to ride a “time trial” to get by, and just pray. Thankfully Mrs. bear was a no-show. Marshia and Sarah leaving the Port Renfrew control. The hills went on, we got slower, it got hotter, the road was unpredictably uneven and frost heaved from a cold winter. The sign for “Shirley” was a welcome sight, but it took forever to get to the “Shirley Delicious Cafe”. I didn’t remember so many damn hills! It is quite a different ride when we were not as fresh from crisp sheets and eggs benny, as we were last time we rode. Again “Saint John” was there with cold water and goodies. Both M’s and my feet had developed “hot foot” caused from heat, inflammation and pedal pressure. Podiatrists call it “metatarsalgia”, a very painful burning on the ball of the foot. If anyone has solved it, let me know! We took some Tylenol in hopes of relief. The nice thing was we didn’t have to consult a route sheet anymore, since there was nowhere else to go, and we knew the roads around Victoria. Sooke Road was a nightmare on wheels, with gravel shoulders. There were a hundred Harley Davidson riders returning from the Festival, cars pulling huge trailers taking the entire lane, speeding trucks, and hoards of reckless beachgoers homeward bound with music blaring. By this time my bike handling skills were deteriorating; double jeopardy in bad traffic. We were just plain lucky! We caught up to an experienced Rando friend on the ride who was suffering from the heat. I gave him 2 Endurolytes (sodium/potassium) and told M, at least we could tell his wife where to find him...! It was an eternity before we spotted Gillespie Road and the end of the torture. The maxim “...if you’re going through hell, keep on going” crossed my mind. When we turned right on Kangaroo Road I swear we heard angels singing. Cool air, shade, smooth pavement, and NO CARS! I never thought I’d love Kangaroo Road – the hills were not over, but we were on our way! We had Metchosin Road to tackle, but now we were goin’ home. It made such a difference and put a little spring in our “hot footed” feet. A few more big hills, then we were on the Blue Bridge, there was crazy tourist traffic, and the finish. Most of the Rando Gods had been finished a long time and had gone to their hotels, showered, changed, had a nap, imbibed cool beverages, and read or written 2 or 3 novels by the time we rolled in. It was so good to be finished. John and Denis, Yvonne and Linda greeted us. I immersed my feet in a cooler of ice to celebrate. Everyone who started the 200km, finished. 100% completion! We took 10 hrs 44 mins and burned 8,845 calories! Thanks to ride organizers Ron and Roxanne and volunteers John Dave, Bob, Sandy, Buddy Mark and Carol. The next 200km I ride (if ever) will be cherry picked! And that was how Marshia and I spent June 24, 2017.